For some, this post will make perfect sense. To many others, it will border on sacrilege. No offense is meant, but I offer a personal analogy for the spirit of anticipation that should be connected to Advent, but is often missing. We are left with a sweet, clean, happy story of Christ’s coming to earth in the form of a human infant, but this robs the story of the visceral emotional impact it ought to have. So, what is my analogy for the birth of the Messiah? Tonight I am attending my very first ever Packer’s game at Lambeau Field. 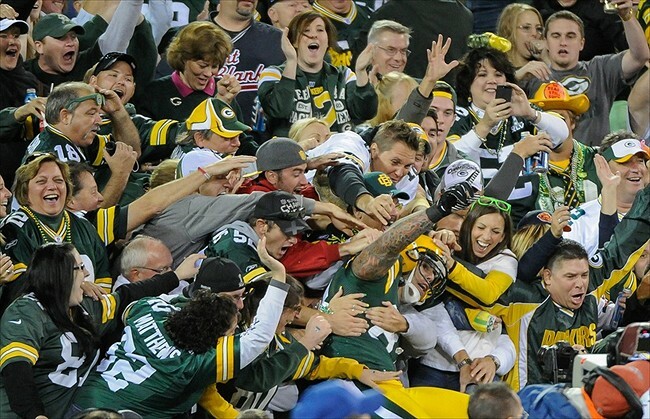 If you are not from Wisconsin, the whole Packer’s phenomenon makes little sense. The closest experience I perceive is the way some ardent fans feel about their college teams. College football is not simply a sport, but a sub-culture. Football is not something played or viewed, it is lived. Fist-fights break out over simple disagreements about teams, coaches, players, plays, referee calls, concessions served, or wearing the wrong colors. People rearrange their lives around the football schedule. They schedule vacations, celebrations and surgeries around home games. The pull the blinds, turn off the phone, and shroud the house in darkness when their team loses. Football is life or death. Envision, if you will, this commitment to team that covers an entire state. Drive into almost any community and you will find a “Packers Pub” or “Bart’s Bar and Grille” (named after Bart Starr — a player retired almost forty years). There are businesses that close on Vince Lombardi’s birthday (June 11) — the famous coach and essentially saint of the Packers pantheon. The Green Bay Packers are unique in that they are owned by the fans, and there is deep pride and respect for this shared ownership. The Packers have sold out their last 389 home games. Lambeau Field feels a bit like Vatican City to Green bay’s Rome. It is a Holy Land unto itself. Football fans around the world have a game at Lambeau Field on their ‘bucket list” — those things one must do before one kicks the bucket. When we speak of the Advent of Jesus the Christ in modern Western culture, we do so in reserved, yet pleasant tones. Few of us live in situations from which we have little hope to escape. Few of us live in fear of losing even the very little we have. Few of us live under a shadow of hand-to-mouth poverty in perpetual hunger and want. Sadly, too many in our world do live under the burden of being disrespected, dismissed and ignored, but those with privilege and position all too often take it for granted. Christmas is no longer a dream come true, but an annual celebration that we enjoy, then put away until next time. To get excited about Christmas (for spiritual and affective reasons, not fun and gifts) is rare and unknown to many. To remember that it is a paradigmatic turning point event is difficult. Oh, yes, it does take over our lives for a few weeks, but as a hurdle to clear, not a new beginning. 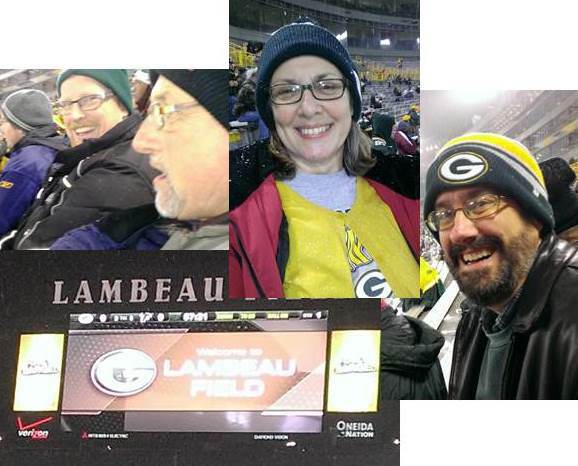 The Packers game has been a gift to me — for it reminds me what it feels like to experience something deep down, at a visceral and trans-rational level. I am hopeful that I can shift the sense of thrill and wonder; awe and giddy excitement from something as silly and mundane as a football game to something essential and eternal. Morning after addendum: The night was as special and magical as one would imagine, though not without its trials. We parked about 3/4 of a mile away (at Bethany UMC) and were given a ride to about a block away from Lambeau Field. We stood in line for 45 minutes, to be turned away because my wife, Barbara’s purse was too big. So we trudged back to the church, deposited her purse, and caught another ride to the stadium. Under the lights, it felt like being in a snow globe — a wet, cold snow globe. The crowd was high-spirited (rowdy), welcoming and energized. Loose-knit, friendly community emerged almost instantly. Well over 70,000 referee’s filled the stadium, calling every play, attempting to correct every mistake on the field. We sat with Jason Mahnke and his dad, Bill. Not knowing ahead of time who we would be sitting with, it was a real treat to get to sit with one of my favorite colleagues and friend ( and his father, too). Almost as soon as it started, it was over (even though we headed out a little before the official end, due to my back. Bleachers are not my friends. The experience was all I hoped it could be, fulfilling both anticipation and expectation. It was fun to get so excited about something so simple. It crossed my mind more than once that it would be great to see such energy, excitement and engagement in our churches as witnessed at Lambeau Field. Maybe it is time we gave people something to stand up and cheer about, or at least reminded them that they already have something to shout from the housetops. Thank you for that vivid picture of what Advent is all about. I was asked in church how I am anticipating Advent and I couldn’t answer the question because I wasn’t anticipating. I was enduring. This blog is a reminder that Advent is an event to anticipate and to participate in as one would any activity you love doing. I am going to begin to anticipate this Advent as I would a Walk to Emmaus. I love working the walks because it brings me to Christ every time. I am now anticipating Christ in Advent and I can’t wait to spend time during this Christmas journey with Him and to accept the Christmas gift of Jesus that is freely given. Today though – I have to disagree with “Few of us live in situations from which we have little hope to escape. Few of us live in fear of losing even the very little we have. Few of us live under a shadow of hand-to-mouth poverty in perpetual hunger and want”. I think more and more, people are living being food insecure and shelter insecure. I know that where I live it, it is very prominent. Wake up and look around you. The statistics show that even in your town – many people do not know where there next meal is coming from. Thanks, Cathy. Please don’t misunderstand my comments out of context — I framed the comments by talking about modern Western culture. I am in full agreement: the problems are real. My point is that the mainstream of our culture — people likely to read my blog, for example — are unlikely to come from these situations. And therefore we live in a blissful ignorance of these realities. The other parallel I was trying to make is that in the first century, these were the rules, not the exceptions. There was no dominant “middle class” in first century Palestine. Almost everyone in the gospel accounts come from the lower/lowest strata of their culture. This is not the case in modern Western culture (while it is actually true of much of the rest of the world). We breathe rarified air, and it makes it very difficult for us to relate to the level of urgency and desire of earlier times and faraway places.